The 5S approach is a simple but powerful method for shopfloor improvement. Progressive shopfloor improvement techniques are vital for companies who want to stay competitive and to achieve world-class excellence. Companies must find new ways to ensure the survival in this competitive environment by adapting to the changing business needs. 5S is a powerful improvement process that gives impressive results. 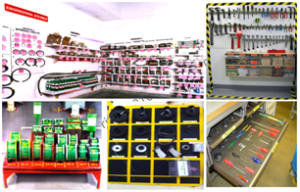 Main challenge of implementing 5S is developing a shopfloor understanding of its key points and tools. Learn how to put this powerful and proven improvement tool in the hands of your entire workforce. Implementation of five pillars of 5S is the starting point in the development of improvement activities. We practice these five pillars in our personal lives without even noticing it. We do keep our things like wastebaskets, towels, clothes etc using Sort and Set in Order. These 5 pillars are in fact the foundation for achieving zero defects, cost reduction, safety improvements and zero accidents. 5S system sounds simple and basic, but we do forget to realise the importance in the daily work of a workplace. Let’s understand these five pillars and how they can help improve your workplace. How useful the item is in our daily workflow? How frequently the item is needed? How much quantity of the item is needed at work? Systematic Arrangement means that you arrange needed items so that they are easy to use and label them so that anyone can find them and put them away.Key steps of systematic arrangement are what to store, how much to store, where to store and how to store. 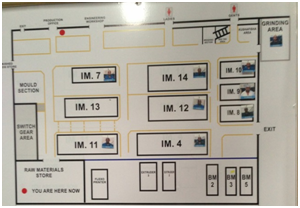 In order todecide on appropriate locations, 5S Map is a tool that can be used to evaluate current locations of parts, jigs, tools, equipment, and machinery, and to decide best locations for these items. The next step is to identify best locations using The Signboard and Painting Strategies that helps to identify, what should go where and in what quantities. 5S Schedules and the Five­Minute Shine are the common tools used in the implementation of Shine. Once cleaning becomes a part of our process, it’s important tostart incorporating systematic inspection procedures into our Shine procedures. 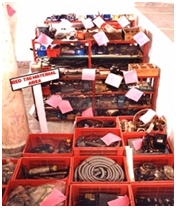 This turns “cleaning” into “cleaning/inspection.”Cleaning/Inspection Checklists and Checklists of Needed Maintenance Activities helps in inspection process. 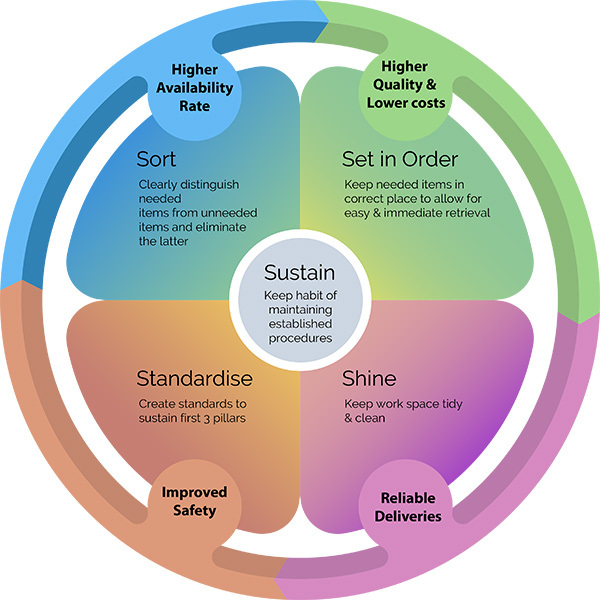 Standardise helps to maintain the first three pillars-Sort, Set in Order, and Shine. Sustain means maintain 4S- Sort, Systematic arrangement, Shine and Standardize. To help sustain 5S activities in your company, it’s important to conduct 5S campaigns using mostcommon tools – 5S Slogans, 5S Posters, 5S Photo Exhibits and Storyboards, 5S Newsletters, 5S Pocket Manuals, 5S Department Tours, and 5S Months. Implementation of 5S sounds simple but any company introducing these five pillars is likely to encounter resistance. Are we not keeping it clean? So, why do we need to implement the five pillars?What can the implementation of the five pillars of 5S do for you? It helps to know what you are expected to do, and when and where you are expected to do it. Not only this, company will also experience many benefits from implementing the five pillars including higher product quality, lower costs, increased customer satisfaction, and corporate growth.